A couple of our friends are growing their own shiso. apparently their plant is going haywire and they have too much shiso for their own usage, so they gave us a bunch. I do mean a bunch! I only used half of it for the pesto. Does anyone want some? 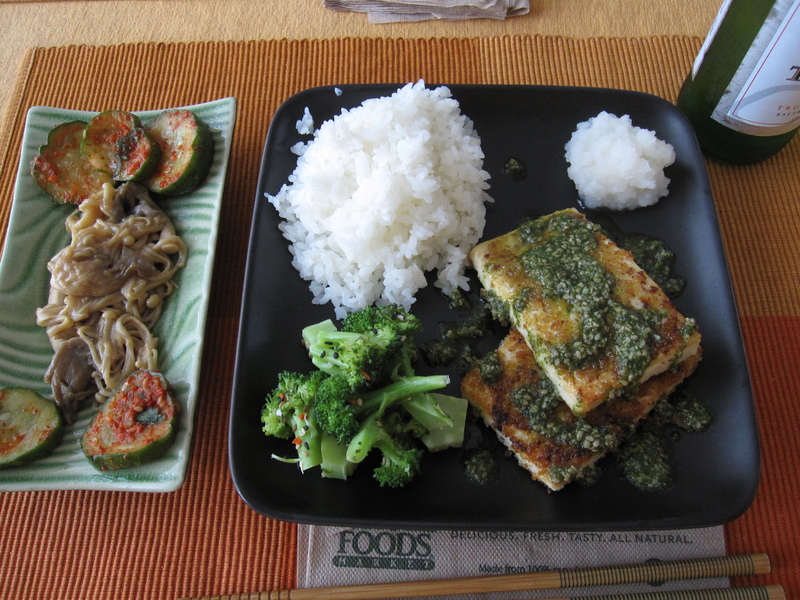 I have a feeling you’ll see at least one more shiso recipe on this blog sometime this week. I made the pesto much like I would a regular pesto, but with a few changes. 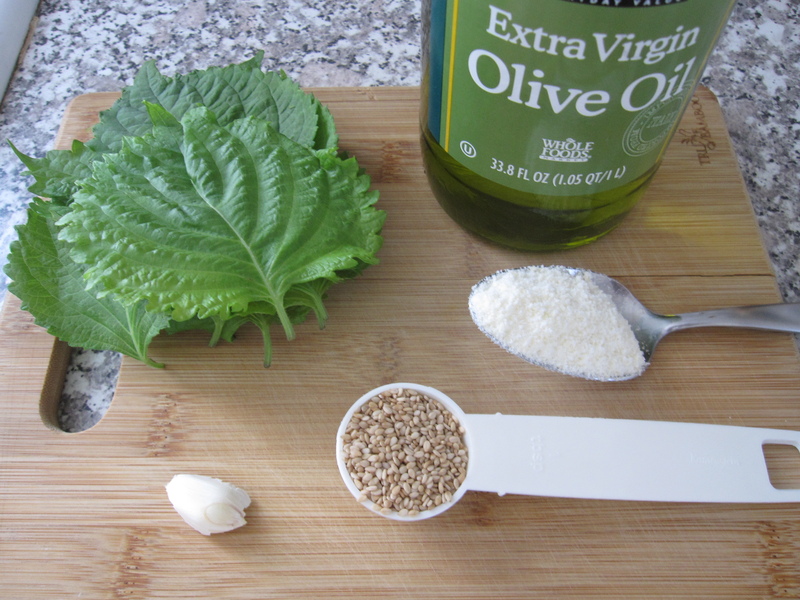 I used about 1/2 ounce of shiso leaves, one clove of garlic, 1 tablespoon of sesame seeds, 1 tablespoon of parmesan cheese, and about 1/4 cup of olive oil. I put it all in my little food processor and whipped it all up. 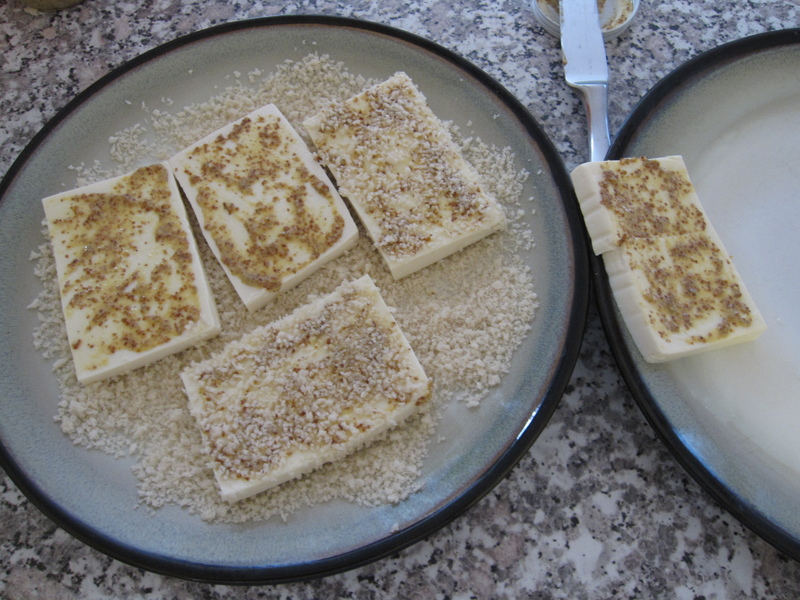 For the tofukatsu I used mustard, 1 block of silken tofu, and some panko. I pressed the water out of the tofu in the fridge for about an hour. Then, I cut it in half. I sliced the halves into 4 equal pieces to look like cutlets. I poured some panko on a plate and then spread a thin layer of mustard on top of each tofu cutlet. 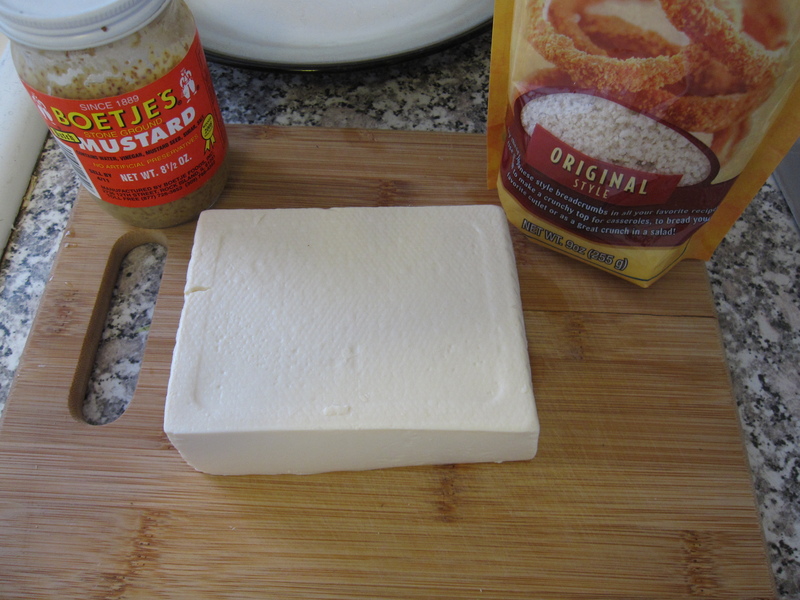 I pressed the tofu, mustard side down, on the panko and spread another thin layer of mustard on the other side then flipped and pressed again. I wanted both sides of the tofu crusted in panko. In a large skilled heated to high I poured in a few tablespoons of peanut oil. I like to shallow fry in peanut oil because it has a high smoking point and doesn’t really have that strong of a flavor. I fried the tofu in two batches so as to not overcrowd the skillet. After both sides were nice and golden I laid them on a wire rack to let any excess oil drip off. I made a couple of sides to go with the tofukatsu. One was a simple steamed head of broccoli. 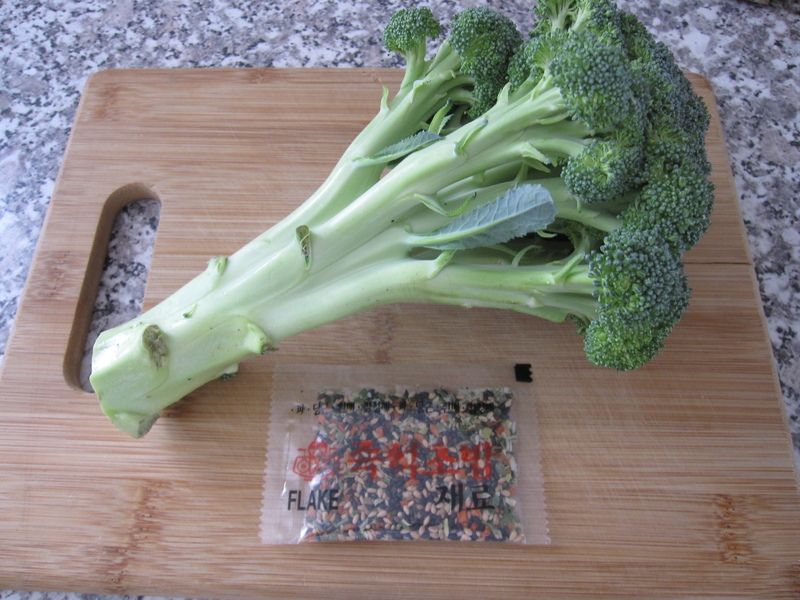 I cut the broccoli down into bite-sized pieces, florets and stem and them steamed it for about 4 minutes. I had a packet of mixed sesame seeds with dried carrot so I decided to sprinkle that on instead of salt and pepper. 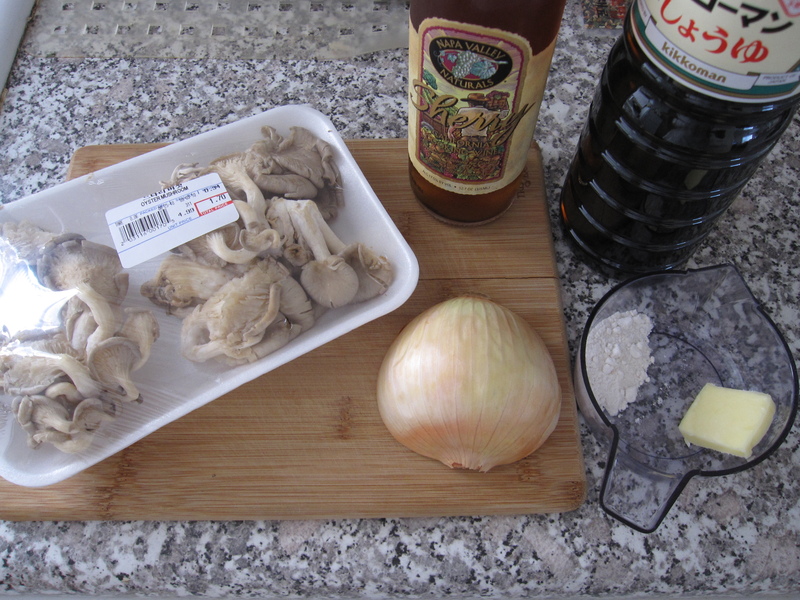 I had about 1/2 pound of oyster mushrooms in my fridge, so I decided to saute them with 1 teaspoon of sherry, 1 tablespoon of soy sauce, 1 tablespoon of flour, 1/2 tablespoon of butter, and I was going to use 1/2 onion. For whatever reason I wasn’t feeling the onion. No rhyme or reason, I just decided not to use the onion and instead use the enoki mushrooms that were in my fridge. I also grated a clove of garlic at the last minute too. In a hot pan I poured in about 2 tablespoons of sesame oil and put the grated garlic in for about 30 seconds. 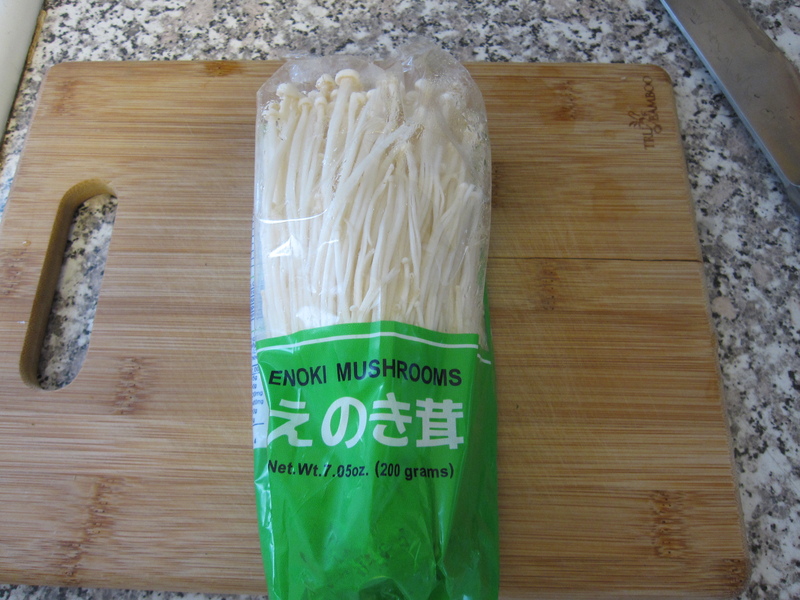 Then, I threw in all of the mushrooms, both oyster and enoki. I let them saute for about 4 minutes and then poured in the sherry and soy sauce. Once the liquid was almost completely boiled off, about 2 minutes, I poured in the flour and butter and stirred that all in. The flour thickened up the last bit of liquid while the butter made it all silky and smooth, as butter always does. 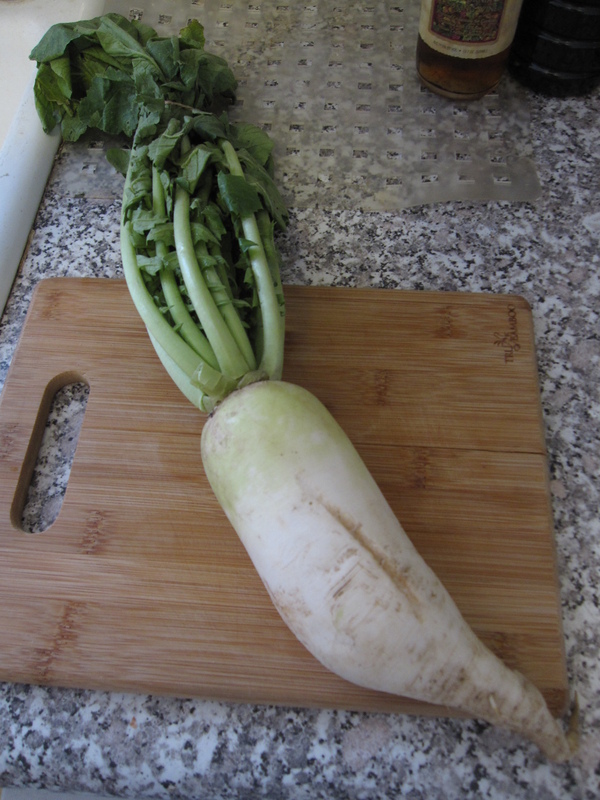 Finally, I took a daikon radish and skinned about half of it. I grated the part that I skinned and served it just as it is. To serve everything, I had some white rice and then put some broccoli next to it and then two pieces of tofukatsu next to that. I poured a little of the pesto on top of the tofukatsu. The grated daikon went on the plate as well. It was a little sharp, so we poured a few drops of soy sauce on it. In a separate plate I laid some mushrooms down. Next to them I put some kimchi cucumbers that we picked up at the Assi Plaza. I’m not a big fan of cucumbers, but these kimchi ones are so damn good they just might make me a believer. Bon apetit! Yuki and I picked up some pre-flavored aburaage (deep-fried tofu) for inarizushi at the Assi Plaza the other day. So, last night for dinner she made some sushi rice with hijiki to stuff into them and I made a quick stew with a couple of kielbasa that I picked up from Andy’s last week. I mean really, what matches sushi better than Polish sausage? Inarizushi is really simple to make. Yuki measured out the rice to make 2 cups in our rice cooker. After she poured in the water the put about 2 tablespoons of dried hijiki in and let it sit for about 30 minutes before turning the cooker on. Once the rice was cooked she dumped it into a large glass baking dish. I stirred it around while she fanned it to release the excess moisture. Then, she poured in a mixture containing 4 tablespoons of rice vinegar, 2 tablespoons of sugar, and a pinch of salt. I mixed that all in until the rice was cooled to room temperature. Prior to that Yuki took the aburaage and boiled it for a few minutes. Aburaage is covered in oil and by boiling it you can remove most of the oil. Then, it’s simply a matter of stuffing the rice into the packets, a job that fell into my hands. Make sure to keep a bowl of water nearby to keep your fingers wet otherwise the rice will stick and you’ll never get the aburaage filled. For the kielbasa I sliced up half an onion, 1 yellow bell pepper, 3 cloves of garlic, half a long napa cabbage, and the two kielbasa. In a pot I heated up a tablespoon of olive oil and tossed in the onion, pepper, and garlic. 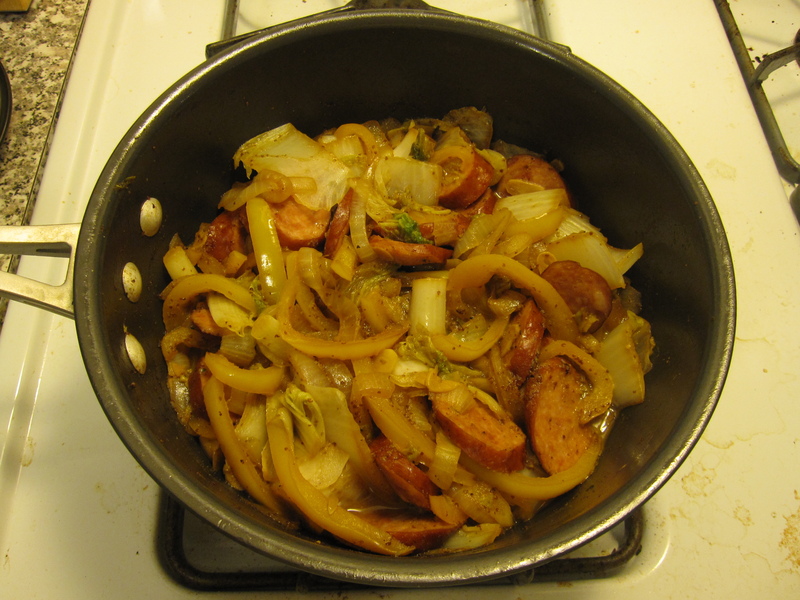 I let those saute down for about 5 minutes and then added the kielbasa, I let that cook for about 4 minutes. Then I tossed in the cabbage and let it wilt down for about 4 minutes. I poured in 1/4 cup dry white wine and let it boil for a few minutes until it evaporated. Finally, I poured in a mixture of 1/4 cup soy sauce and 2 tablespoons of mustard. I let that boil down for about 5 minutes and that was it, just a little black pepper to season. To serve, we put a shiso leaf underneath the inarizushi. 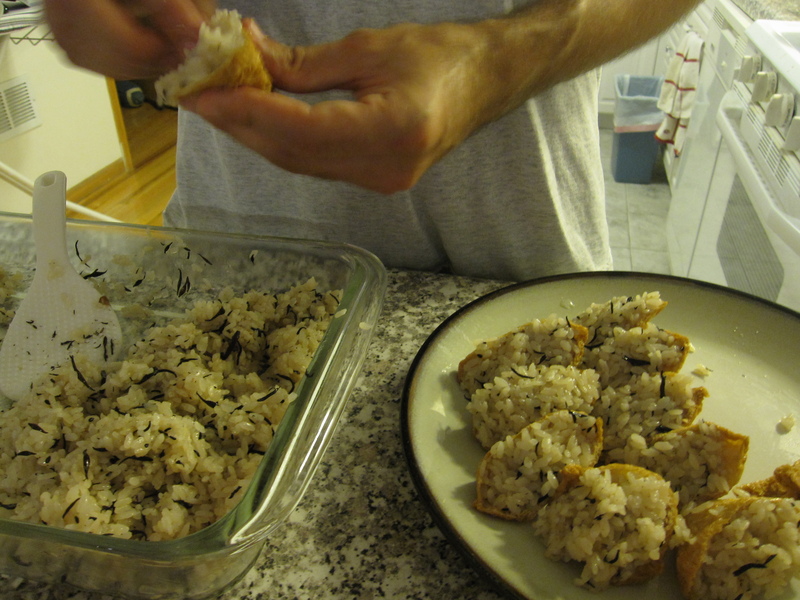 We also served the extra rice because we made more than we could stuff into the aburaage. 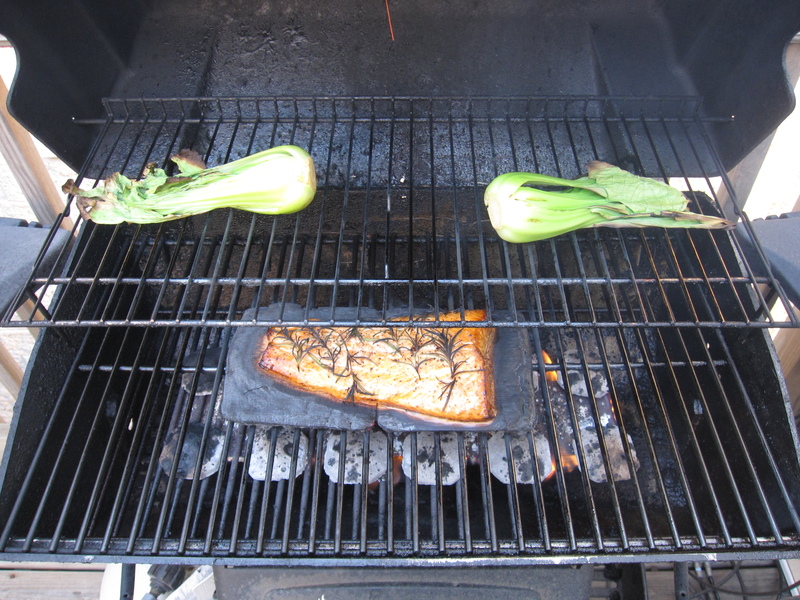 I made this delicious salmon on the grill with some cedar planks. To go with it I made a miso soup and a cherry tomato caprese. This menu was kind of all over the map, but it worked out. I first made the caprese. 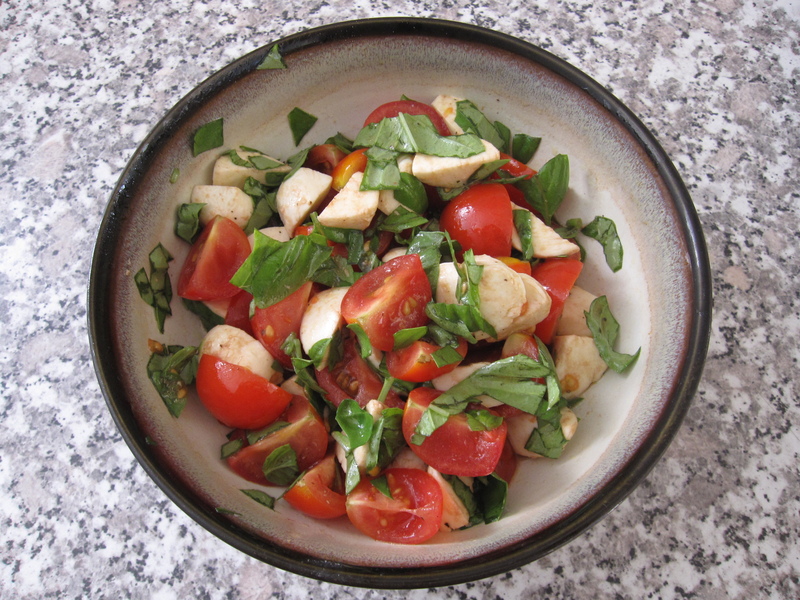 I simply quartered the cherry tomatoes and cut some mozzarella di bufalo and then tossed them with a drizzle of olive oil, a drizzle of balsamic vinegar, and some sliced up basil from my back porch. A little salt and pepper to bring out the flavors and that was ready. Then I got the soup rollin’. 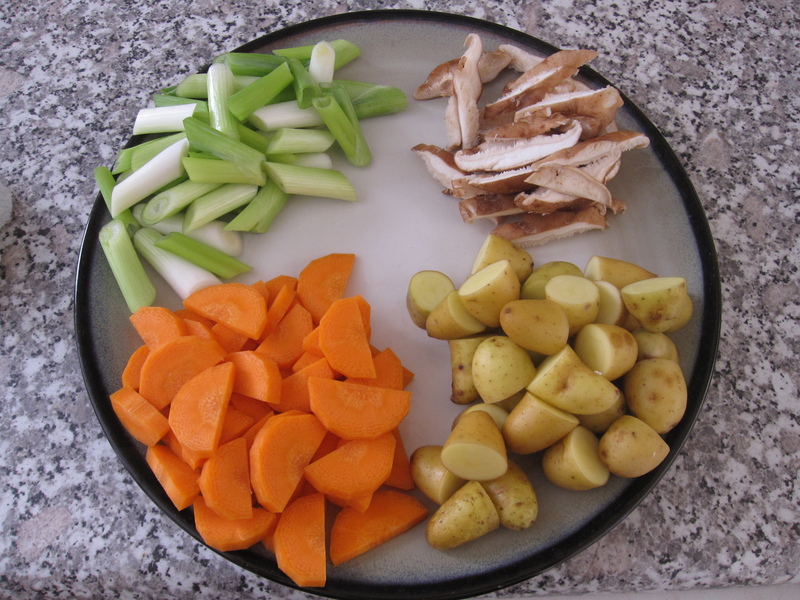 I chopped up 4 green onions, half a package of shiitake sliced, 7 fingerling potatoes cut into bite sized pieces, and a carrot cut into half-moons. I dumped them all into about 6 cups of water and brought it all up to a boil. Once boiling I turned the heat down to medium and let it all simmer for about 10 minutes, just until the veggies were softened and tender. 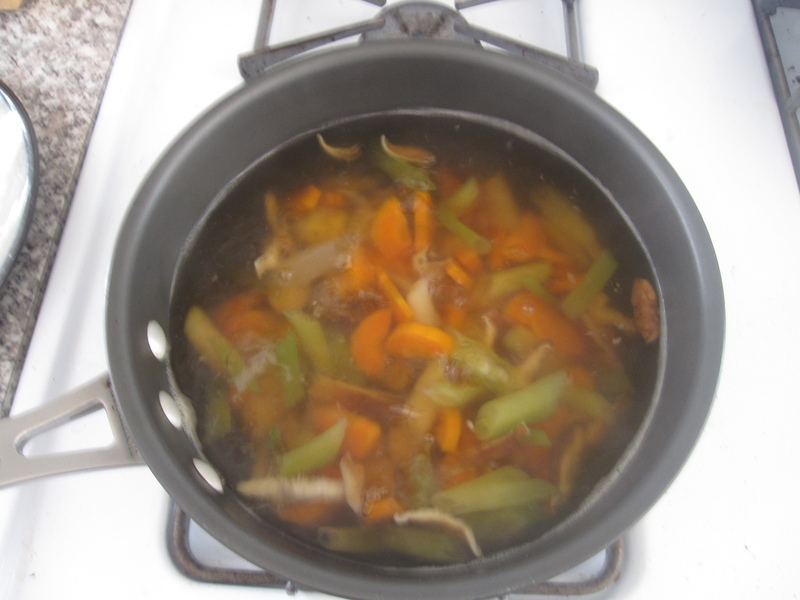 Then I added about a teaspoon of dashi-no-moto and turned the heat down to medium-low. I covered it and kept it warm while I grilled the salmon. I had a beautiful piece of salmon that weighed in at 20 ounces. Perfect for 4 portions at 5 ounces each. I simply seasoned it with salt and pepper and then laid some sprigs of rosemary on top that I cut from my plant out back. I had a couple of small cedar planks that I soaked in water for about 2 hours. You can see from the picture that they were pretty cheap as I’ve never had cedar burn up quite as quickly as these did. 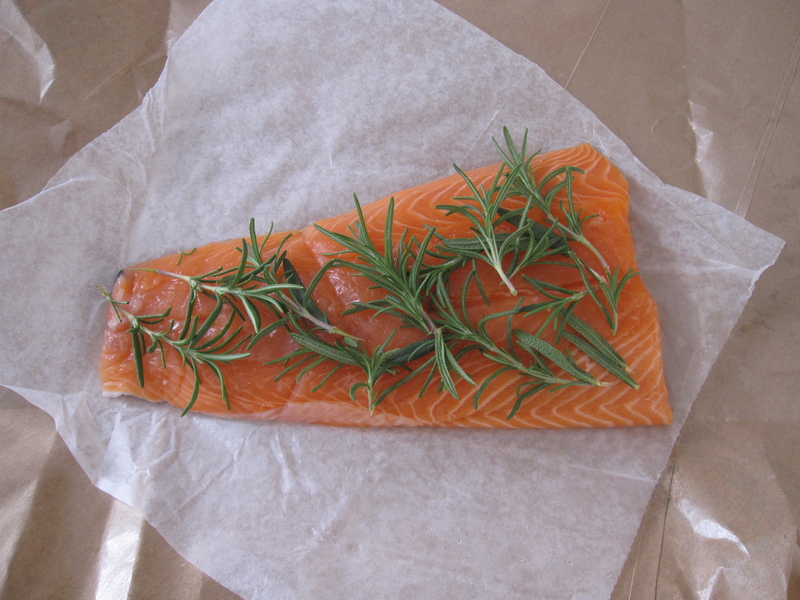 It did no harm to the fish though as it stayed nice and moist and absorbed some great smokey cedar flavor. I also had a couple of bok choy that I halved and grilled. I was careful to keep the green leaves away from any direct heat to keep them from burning. They still charred a little around the edges, but that just added some flavor. 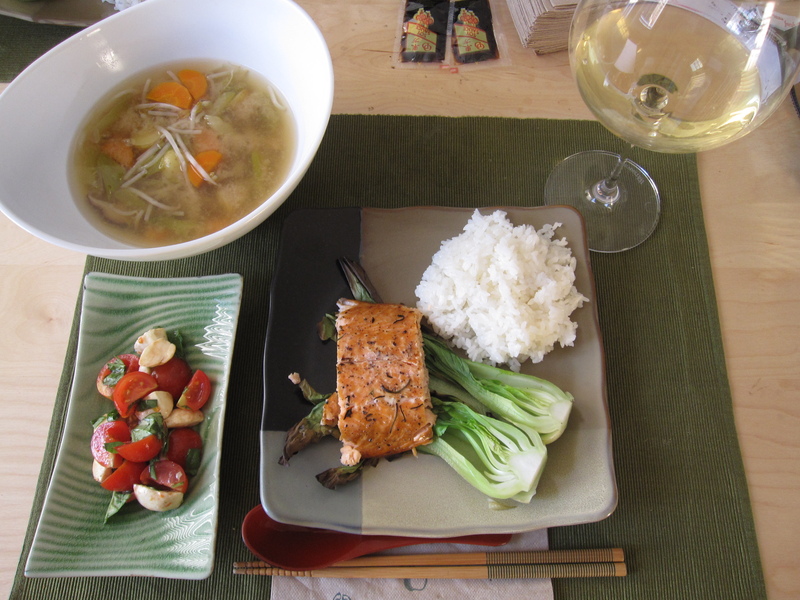 When all was ready I cut the salmon up and served it on top of the bok choy. I had some white rice as well. For the soup, I found some bean sprouts in my bottom drawer so I threw them in at the last minute as they don’t need much cooking at all. Then I mixed in 2 heaping tablespoons of shiro miso and served it up. 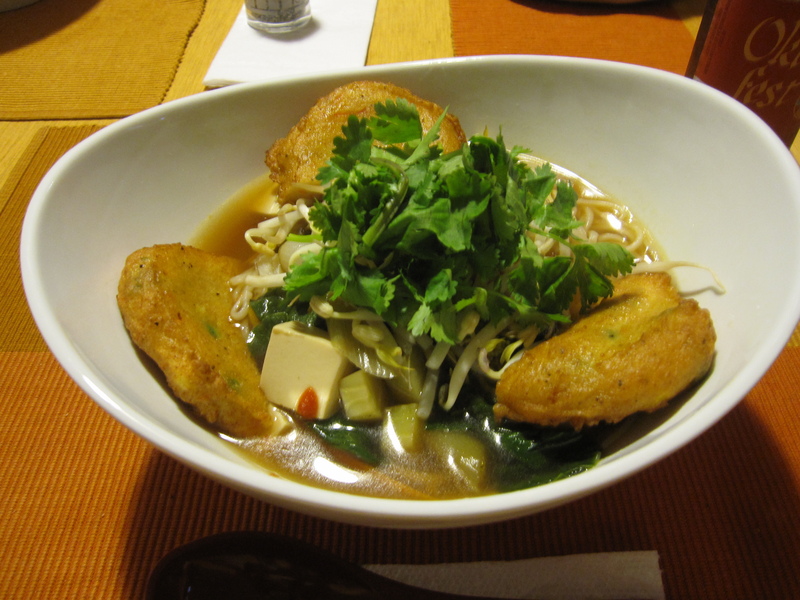 Last night I made some noodle soup using Vietnamese rice noodles, pho-like broth, and Japanese fish cakes. Not sure what to call this dish, so I’ll just call it Japanese Pho. It was very simple to make and actually tasted really really good. First thing I did was make the broth base. 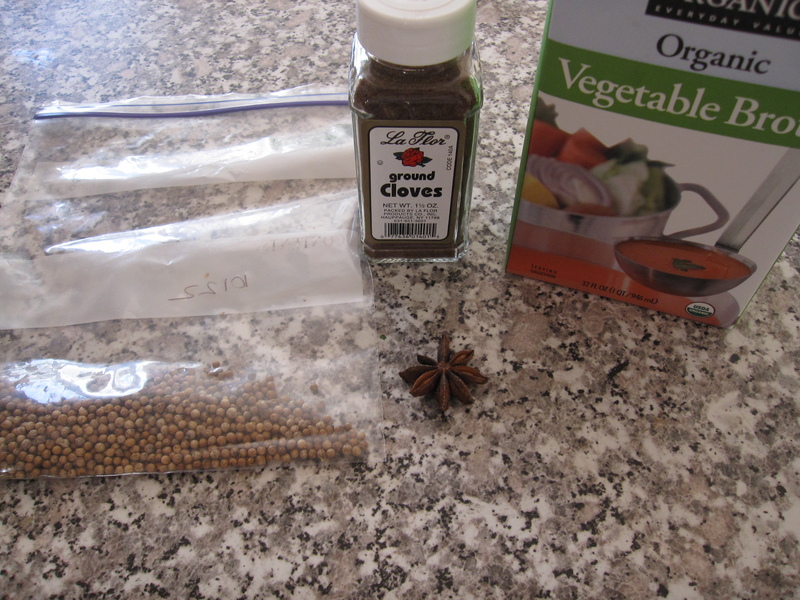 I crushed 1 teaspoon of coriander seeds and 1 star anise with my pestle and mortar. Once they were ground to an almost fine powder I added 1 teaspoon of ground cloves. I wish I had some ginger, I would have bashed that up and added it as well. At any rate, I had 3 cups of vegetable broth in my fridge that needed to be used up so I poured that into a pot, dumped the spices in, and let it boil for about 10 minutes. After that I turned off the heat and let it sit while I prepped the rest of the dish. 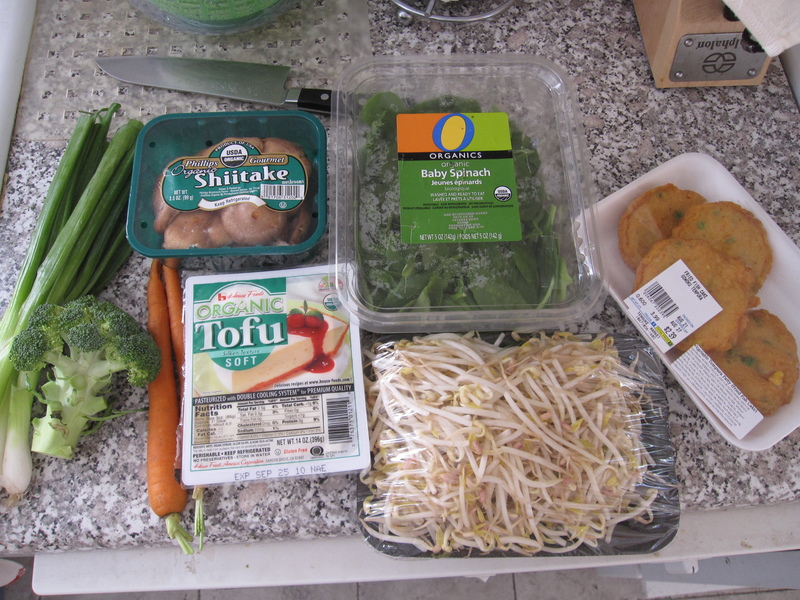 My ingredient list included 4 green onions sliced into inch length pieces, a small head of broccoli chopped up, two small carrots cut into thin strips, 2/3’s of a pack of shiitake sliced, half a cube of silken tofu diced, about half a container of baby spinach, about 4-5 ounces of bean sprouts, and 3 fish cakes from the Tensuke Market (these fish cakes had slivers of carrot and peas in them, one of my favorites). In a clean pot I strained the broth base discarding the grit. I made sure to press the grit though to make sure I got all of the flavorful liquid. 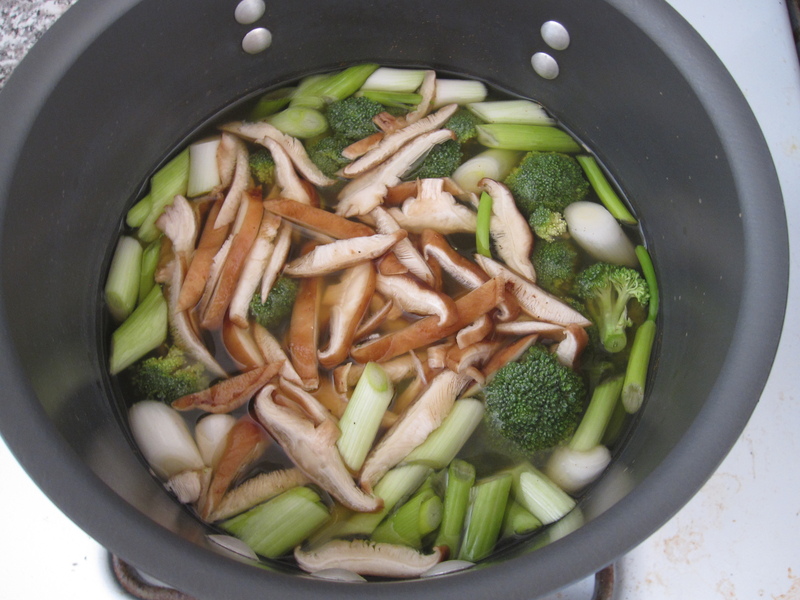 To that I added about 3 cups of water, 1/4 cup soy sauce, 1/2 teaspoon of dashi-no-moto, and 3 tablespoons of sesame oil. Then I tossed in the green onions, shiitake, and broccoli. I brought all of that up to a boil and let it go for about 7 minutes while toasting the fish cakes. After that I added the carrots, tofu, and baby spinach for about 3 minutes. That was it, I turned off the heat. 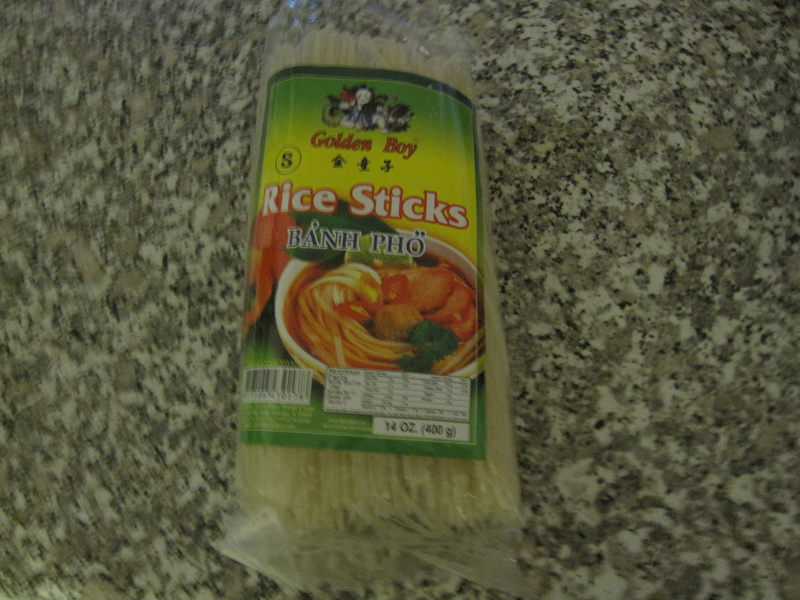 While the soup was cooking I boiled some rice noodles in a separate pot with just plain water. I did that according to package instructions and then drained. In my serving bowls I first put in the noodles. Then I ladled the soup on top and squeezed in some sriracha. On top of the soup I put in some bean sprouts and garnished those with some cilantro. I placed the halved fish cakes around the edge. 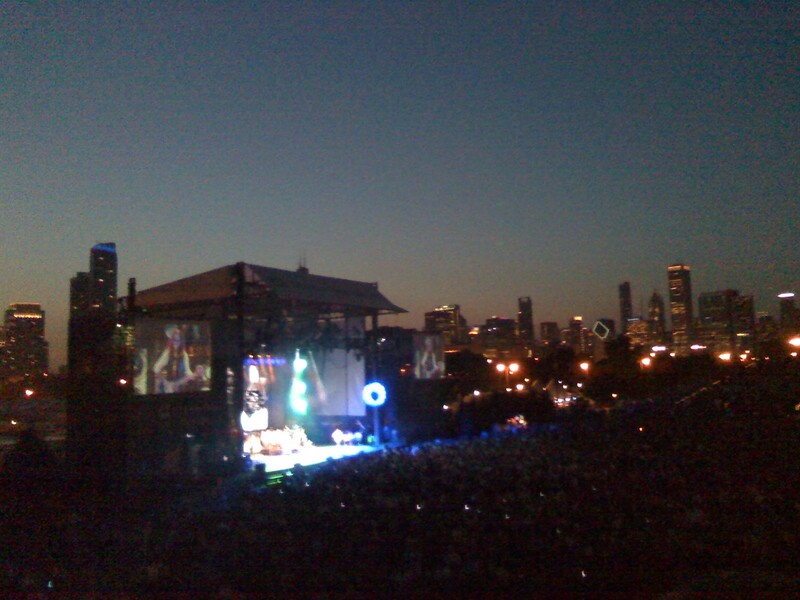 Last night Yuki and I went to see RUSH at Northerly Island. What a great band! Because of that I didn’t cook Meatless Monday, though I did eat a falafel sandwich with some babaganoush before the show to keep with the theme. I tell ya, being at the concert really drove home the point that all Americans need to adopt a healthier diet as at least 75% of the concert goers were way overweight. That might be an understatement too. Concert seats are only so big and literally everyone around us was well over 200 pounds. I felt claustrophobic at time. America, start eating healthy well-balanced diets!!! But that didn’t stop us from enjoying the show. At any rate, I’m going to blog about the dinner we had Saturday night. We were out in Schaumburg so that we could stop at the Tensuke Market, which is actually in Elk Grove, but just south of Mitsuwa. 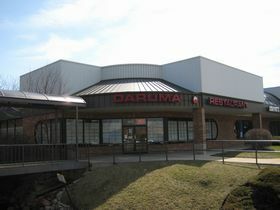 It’s smaller than Mitsuwa but sometimes has better deals and has the absolute best retail seafood in the Chicago area. If you want to make sashimi at home, I highly suggest making the trek to Tensuke for your fish. There’s a restaurant called Daruma that Yuki had wanted to try for a while so we decided to give it a try. Honestly, walking through the doors was almost like walking into Japan. I mean that in every good way possible. The decor is very traditional of casual dining in Japan. The Japanese don’t put a whole lot of stock into gaudy decor, instead they prefer to focus on high quality food. The walls were poorly painted, the tables and seats a little worn down, cheap napkins (in Japan you usually don’t find any napkins). It really felt like a restaurant in Japan. Made me feel homesick even though I’m not Japanese. Service was pretty good. All Japanese servers, but bi-lingual so don’t worry. It was the food that starred though. 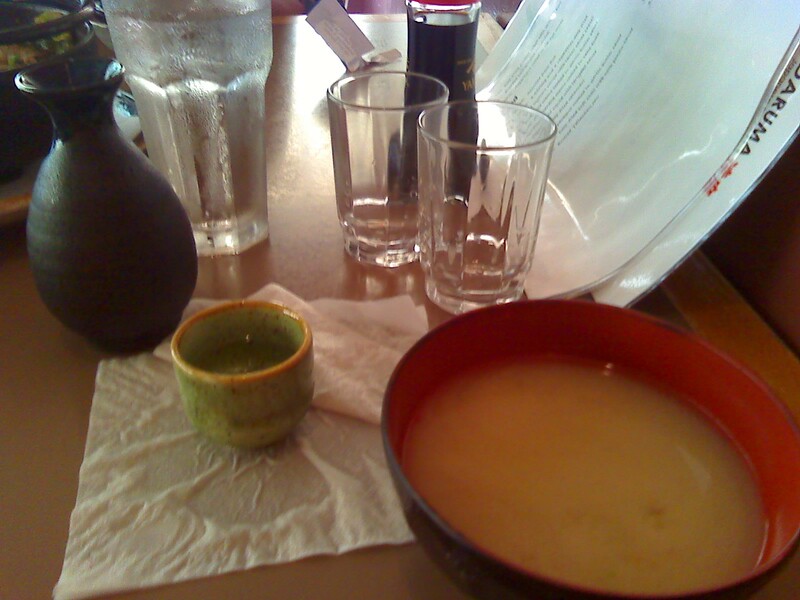 We started off with some Miso Soup. Nothing fancy, just a well made miso soup with wakame and tofu. I also had some sake. I was torn between two kinds so they gave me a couple of samples. The samples were very generous and I honestly didn’t need to order any sake due to the large pours. But, I did get a sake from the Nara Prefecture. 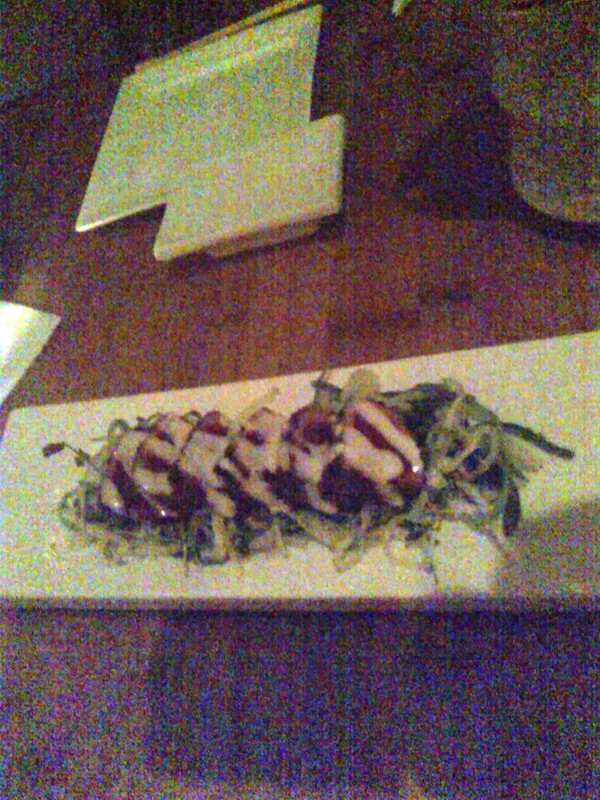 We got a Daikon Salad. 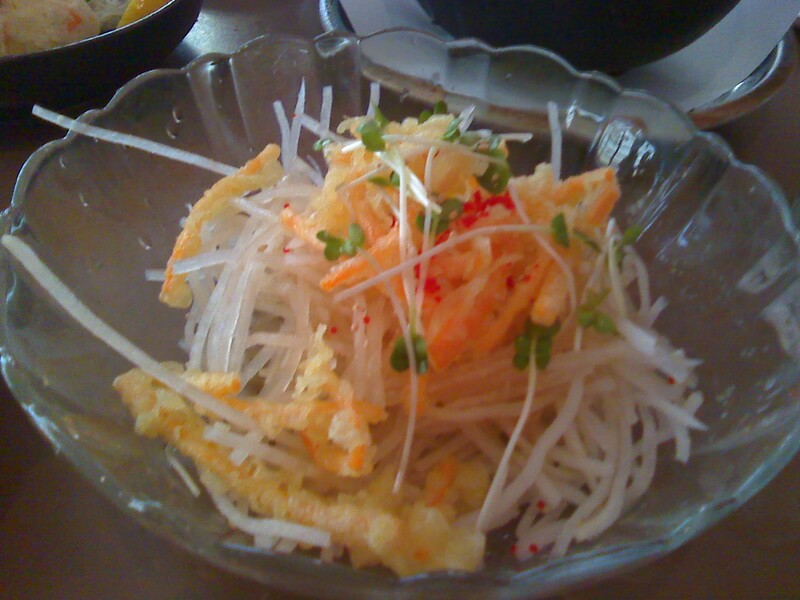 Thin sticks of daikon served with carrot stick tempura and a shiso dressing. Carrots often accompany daikon, but this is the first time I’ve seen carrot tempura with the daikon. Nice touch. Little pea shoots for a bit of peppery bit and color. We ordered two maki rolls. Ebi Ten, shrimp tempura with avocado, cucumber, and smelt roe. Unakyu, fresh water eel with cucumber. The sushi was good. Not the best I’ve ever had, but overall solid. Tatsuta Age, deep-fried chicken thigh. 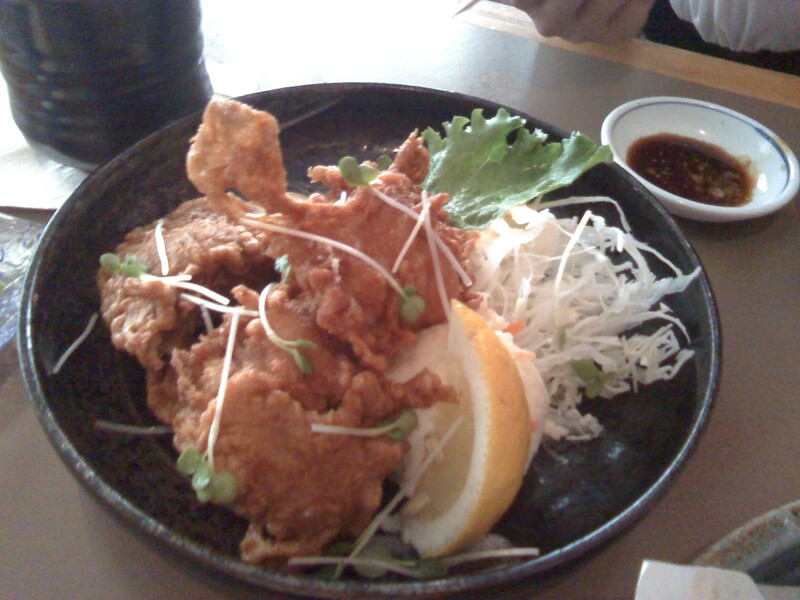 Usually served in smaller pieces and called karage, these were pretty big chunks of chicken. Served with shredded cabbage, potato salad, pea shoots, and a slice of lemon this is a classic. It’s also one of mine and Yuki’s favorites. 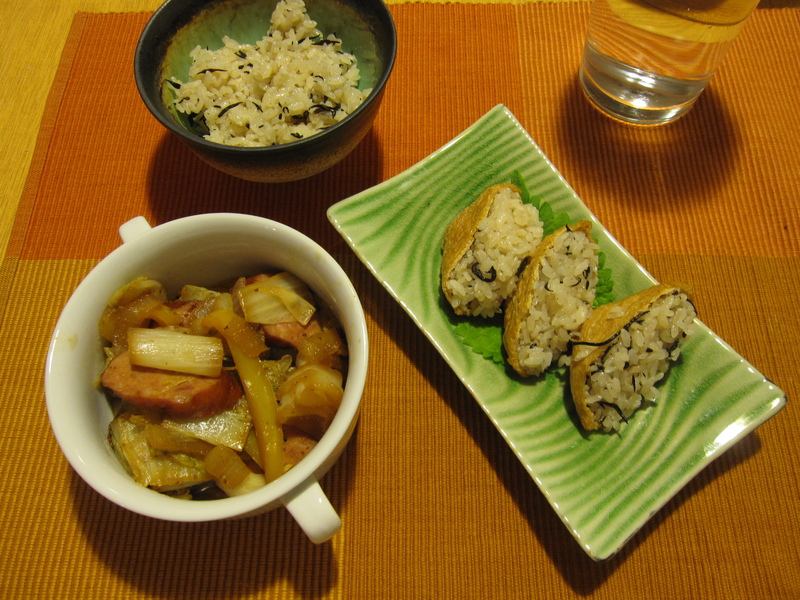 Niku Tofu, a play on the popular Japanese home cooked dish called niku jaga (meat and potato). Instead of potato Daruma used tofu. 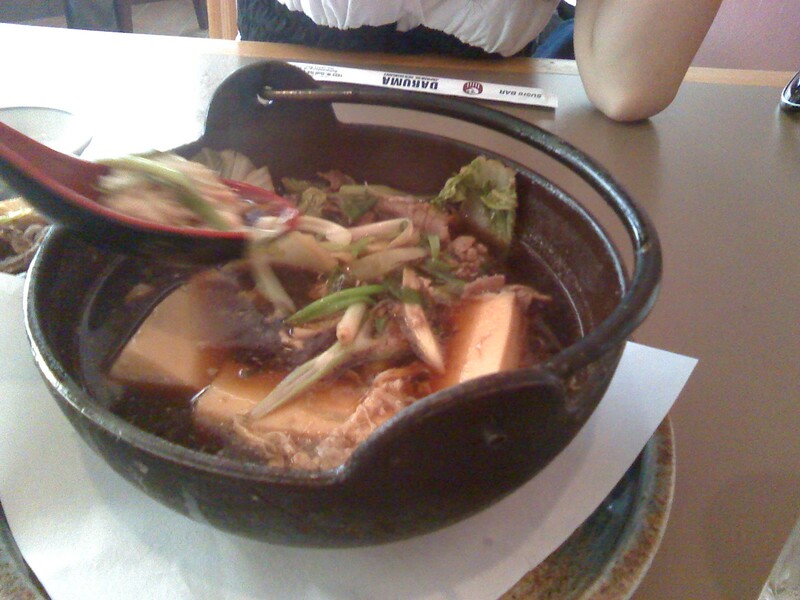 It’s thin sliced beef with tofu simmered in a sweet soy broth. Also simmered in the dish were chopped napa cabbage and green onions. This was delicious! Hamachi Kama, the absolute star of the show! 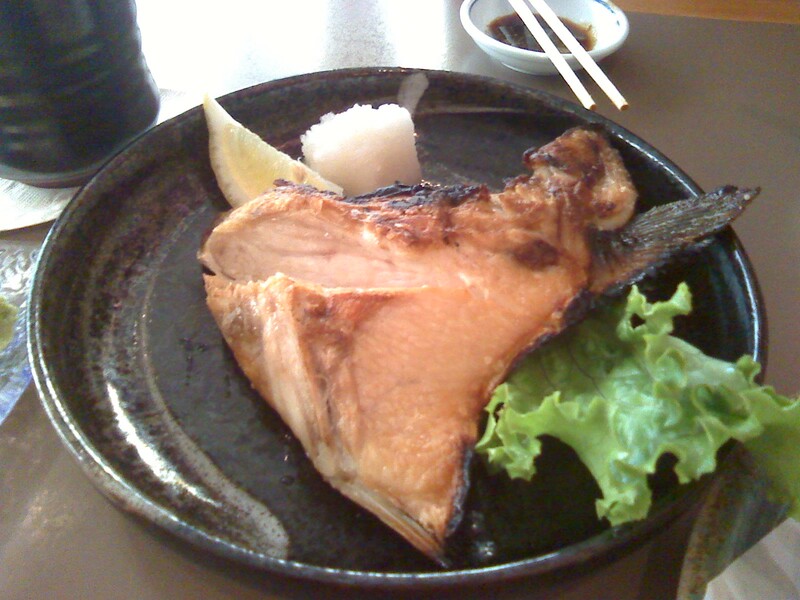 Yellowtail jaw broiled to perfection. You got all of that flavorful cheek meat, easily the best part of any large fish. I don’t know why this part isn’t served more in American cuisine because it has so much more meat and flavor than our prefered filets. This chunk of fish was so tasty it almost brought a tear to my eye. My stomach thanked me for eating this. 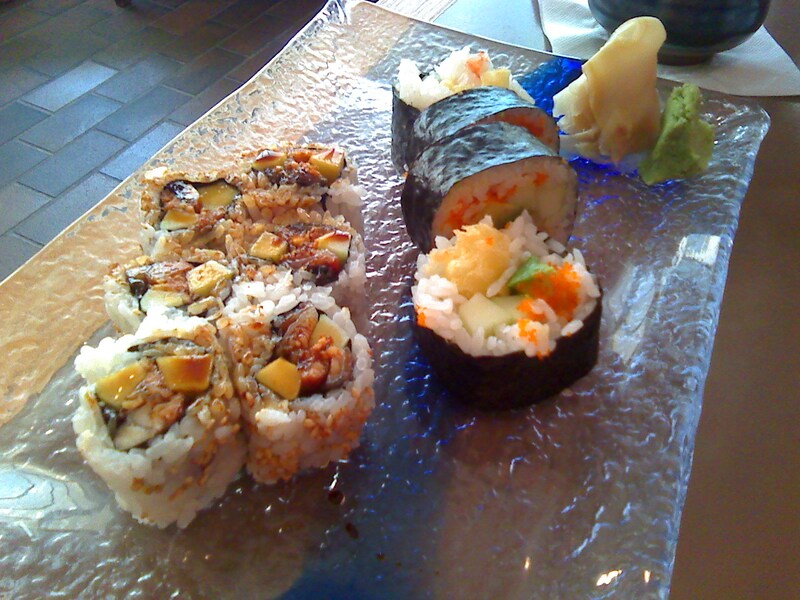 Overall, the food and ambiance at Daruma were fantastic. So far it’s the most authentic Japanese restaurant we’ve been to in the Chicagoland area. The food is delicious, portions are priced accordingly (we had leftovers), and the sake was flowing. The only downfall of this place is that I have to fight Hwy 90 traffic to get there. Next time Yuki’s parents are in town we’re definitely taking them there to show them that there is real Japanese cooking here. Last weekend I did a little searching to try to find the best ramen noodles in Chicago. It’s damn near impossible to find a good, authentic bowl of Japanese ramen in this town as all Japanese restaurants seem to be the same neighborhood sushi joint serving up Americanized sushi (ie- California Roll, Dragon Roll, Philly Roll, etc.). While that’s all well and good, what I wanted was ramen! While searching online I came across very positive reviews of newly opened (only about 3 weeks old) Arami on Chicago just west of Wood. Billed as an authentic Japanese restaurant in my neighborhood I got a little excited, tingly you might say. Not really in the mood to cook last night I decided to take Yuki out and give Arami a go. Very wise decision indeed. The decor is true to Japanese philosophy, very simple and natural. The entrance is a big torii (traditional Japanese gate) and sets the atmosphere off right. The walls are very light, somewhere between eggshell and wasabi green, but more on the eggshell side. The tables are bamboo and the fixtures look to be made of reclaimed wood. I especially like the bar. It’s just a big slab of tree trunk. Service was excellent. Usually, when a restaurant first opens up, the service is the worst part of the experience. The place ran like a veteran. Our server, Tiffany, was very knowledgable of the menu and very attentive without being annoying. Food came out in timely order and nothing was rushed. As I get to the food I want to apologize as I usually do when posting pics from my phone. They are terrible! 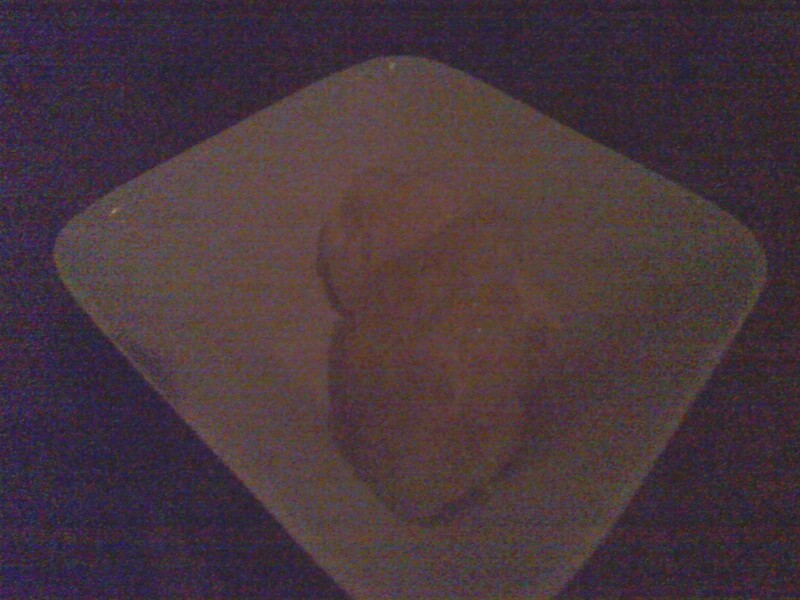 I do my best to make the food visible, but my phone’s camera is a piece of junk. Keep that in mind and don’t let my pics deter you. We started off with the Togarashi Seared Tuna. A beautiful strip of tuna coated in togarashi and seared perfectly, about a millimeter cooked all around the edges with the center completely raw. There were 6 pieces served on top of a seaweed and kelp salad with a meyer lemon dressing. The seaweed and kelp salad was excellent. A lot of times seaweed salads are just dripping with vinegar. Not this one. Perfectly dressed and a nice compliment to the natural fat of the tuna and mild spice of the togarashi. Next, we got the Akami Ankimo. 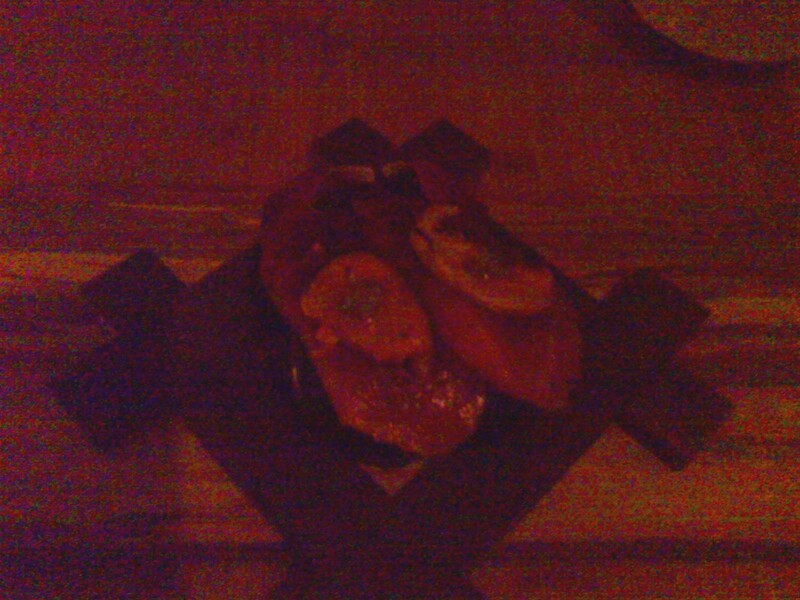 Akami is the red part of blue fin tuna and ankimo is monkfish liver (one of my all-time favorite ingredients). The slices of akimi sashimi (you could tell that they were cut by professionals who understand the subtlety of cutting fish) topped with small slices of ankimo and some sort of sliced green. Yuki thought it was a kind of pepper, but I think it’s just the green part of scallions. Doesn’t matter whose right, it was outstanding! Too bad Arami doesn’t yet have a liquor license as sake would have matched this perfectly. For an entrée Yuki got the Kimchi Ramen. Hands down the best ramen I’ve ever tasted in this city! The broth was maybe a little too light to be considered authentic (in Japan the best part about ramen is all of the gelatin from using bones to make the broth, your lips should feel a little greasy), but the flavor was fantastic. 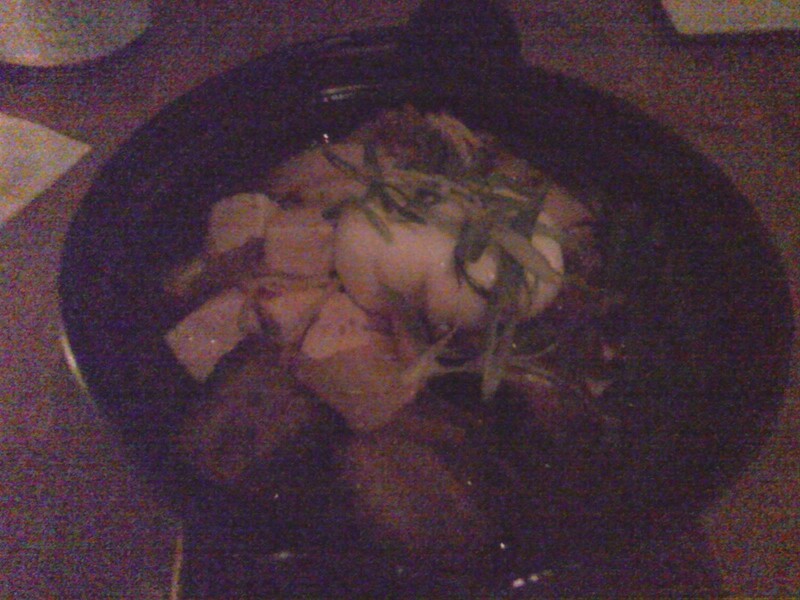 Thick chunks of pork belly, cubes of tofu, sliced kimchi (not an authentic Japanese flavoring for ramen, but a delicious one), a par-boiled egg with a nice runny yolk, and sliced scallions for garnish. The only real problem is that it’s too hot in Chicago right now to eat ramen. Yuki was sweating a little from eating it. That didn’t stop her though as it was friggin fantastic. When ever I see short rib on a menu there’s a very high likelihood that’s what I’m getting. Combine that with my love for all things donburi and I had to get the Short Rib Donburi. 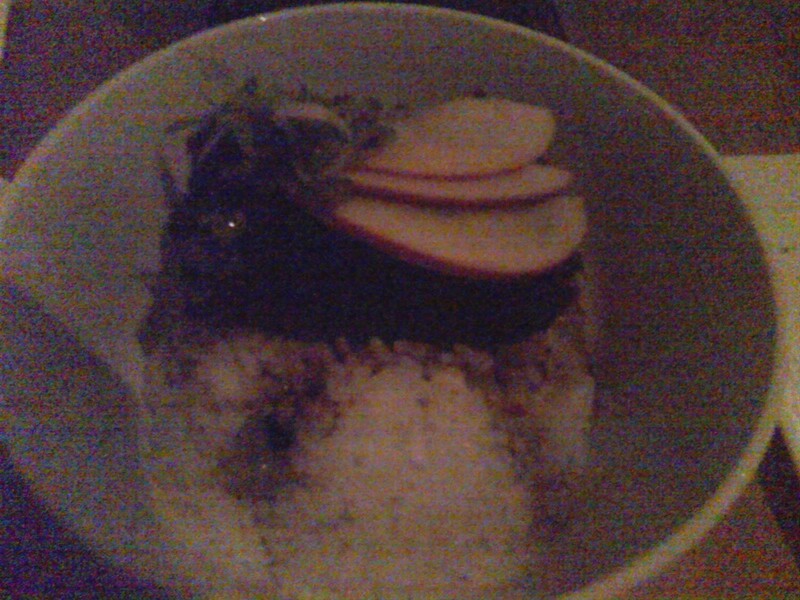 I really nice short rib braised in a soy-based broth served on top of rice. To counter the fattiness of the meat they serve it with sliced pickled asian pear and scallions. The rib was very tender and the broth flavors almost penetrated completely through. I’m glad it didn’t to preserve the natural flavors of the meat itself. Another winner in my book. Dessert is the one area they fell short on. The only two options were the typical mochi ice cream balls or three different gelatos. I asked if the gelato was made in-house and Tiffany said it wasn’t. We still opted for the gelato though. They had three flavors (green tea, ginger-lemon, and muscato) and you get two scoops per order. We were told that we could only pick one flavor, but Tiffany talked the chef into letting us have two, so we got the green tea and ginger-lemon. The green tea was terrible! Overly sweet and very chunky. It was not a good product and they need to get rid of it immediately! The ginger-lemon, however, was great. Not too sweet, nice and creamy. They could do more with desserts though. I’m tired of every Japanese restaurant serving mochi ice cream and ice cream. There are so many things that can be done with Japanese ingredients to make great, simple desserts. Green Tea Pot De Creme with Adzuki Ganache was an idea I gave Tiffany. She seemed to like that idea, so hopefully she can get the chef to open his mind and make some real desserts. You don’t have to be a pastry chef to make good desserts. 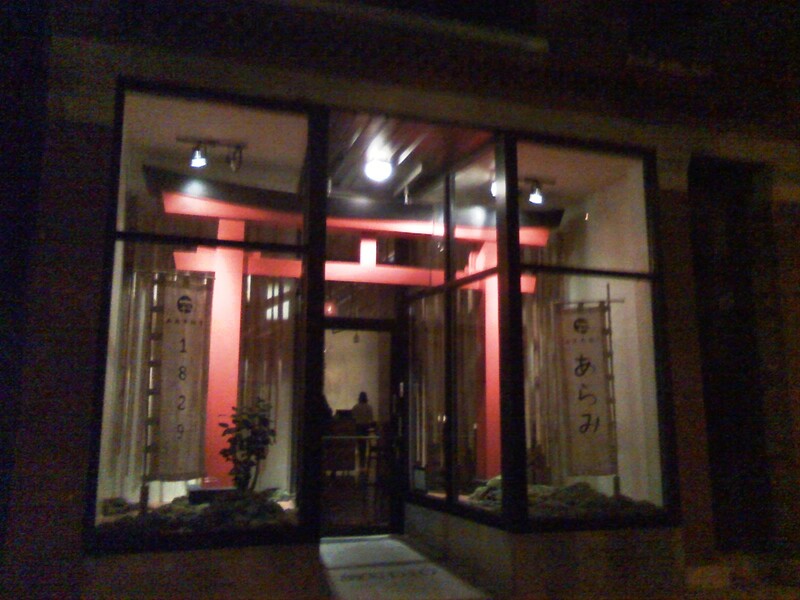 At any rate, Arami is our new favorite Japanese restaurant in Chicago. While we didn’t try a lot of the sushi, we could see that they know what they’re doing. We will definitely be back over and over again, especially once they get a liquor license as I was told they’ll have a killer sake list! Sushi and sake, sounds good to me. Last night Yuki and I went to Millenium Park for another one of their Made In Chicago: World Class Jazz shows. 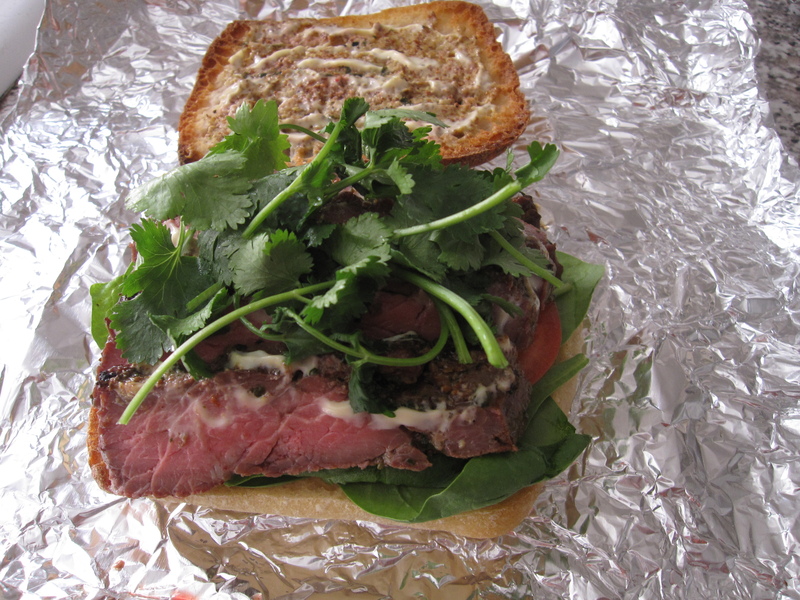 Besides listening to some killer guitar by Alfonso Ponticelli we ate some killer skirt steak sandwiches that I made earlier in the day, along with some potato salad. 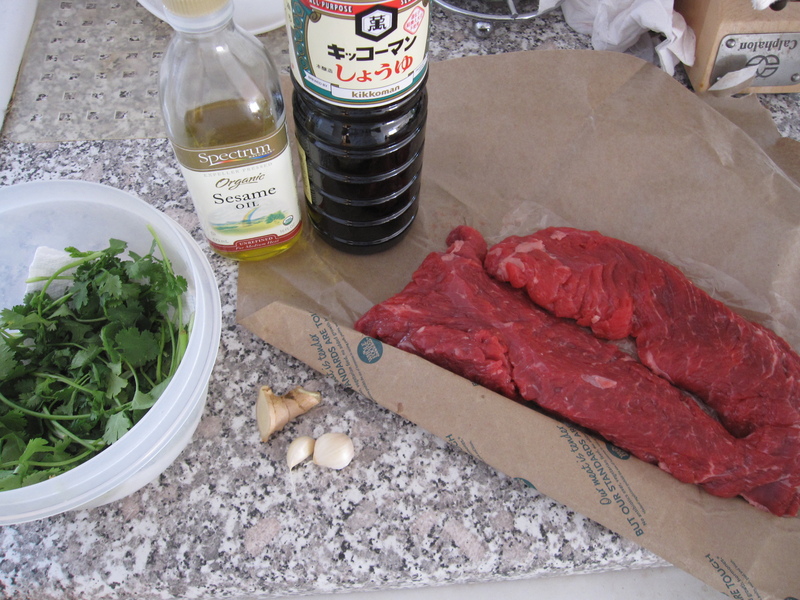 For the steak I took a big handful of cilantro, 1/4 cup of sesame oil, 1/4 cup of soy sauce, 1 tablespoon of ginger, and two cloves of garlic. 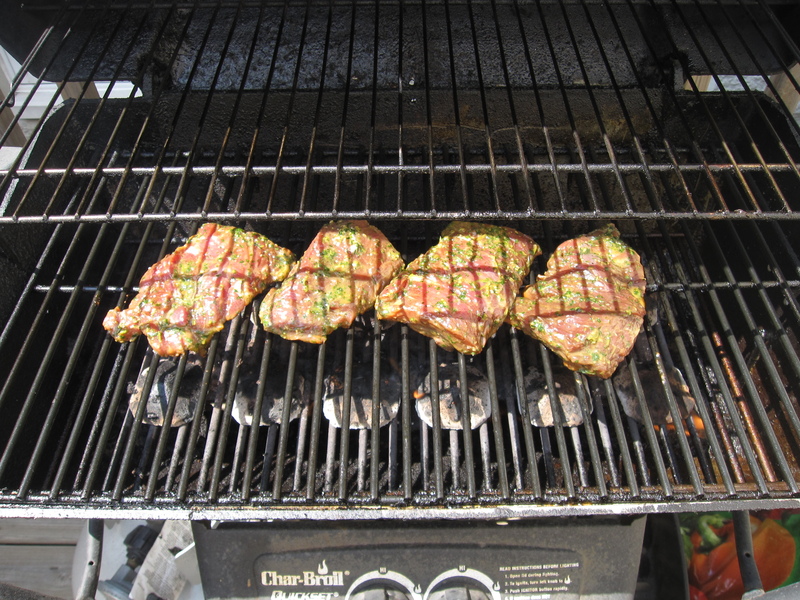 I processed it all into a nice marinade along with some black pepper. I picked up a 1.5 pound skirt steak and cut it into 4 equal pieces. I laid the steak in a glass baking dish and covered it in the marinade. I wrapped it in plastic and put it in the fridge for about 3 hours. I took it out and let it come to room temperature for about a half hour before grilling it. I brought my grill up to high heat and grilled the steak for about 7 minutes on each side. That made it somewhere between medium-rare and medium. I let it sit for a few hours to cool down in its own juices while I went back to my computer to do some work. For the potato salad I defrosted about 1/3 cup of frozen organic peas and chopped up a bunch of green onions, a carrot, 4 radishes, and 7 yukon gold potatoes that were skinned before getting chopped up. 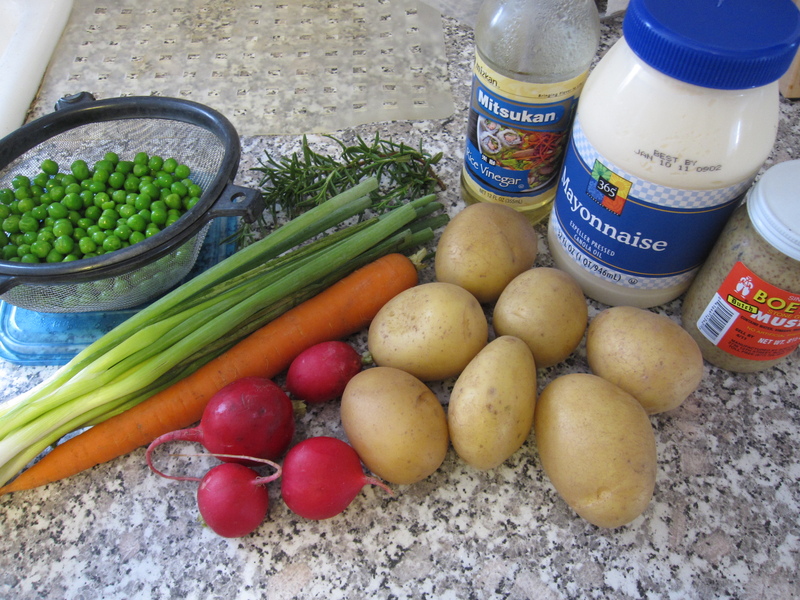 For the dressing I mixed together a branch of rosemary from my back porch that I gave the once over with my knife, 2 tablespoons of rice wine vinegar, 1/4 cup of mayonnaise, 3 tablespoons of mustard (my favorite brand of Boetje’s of course), and a pinch of salt and pepper. In a pot of boiling water I dumped the skinned diced potatoes and let them cook for about 10 minutes until they were soft but held their shape (may take a little longer depending upon how big the chunks are). 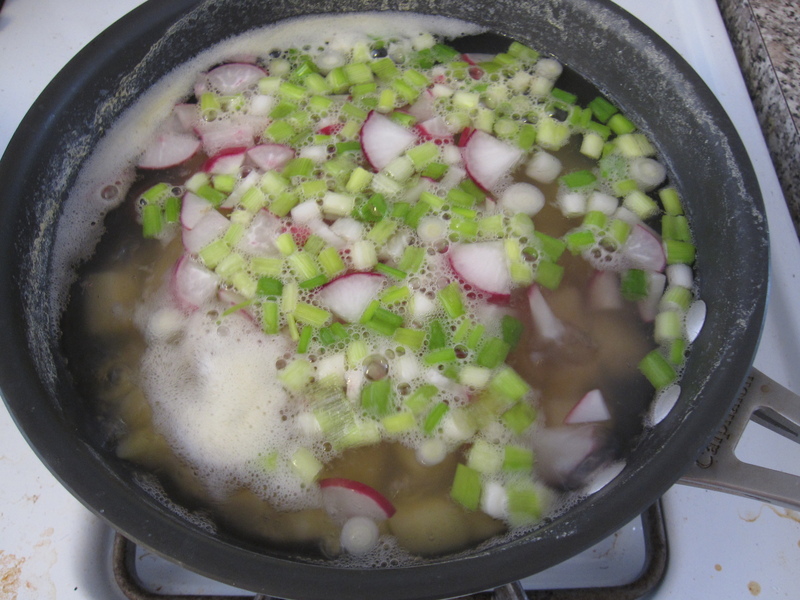 After 10 minutes I added the green onions, radishes, and carrot for about 2 minutes. I didn’t want to cook the vegetables, I just wanted to take away the sharpness and rawness of them while keeping the texture. Then I strained everything into a colander. 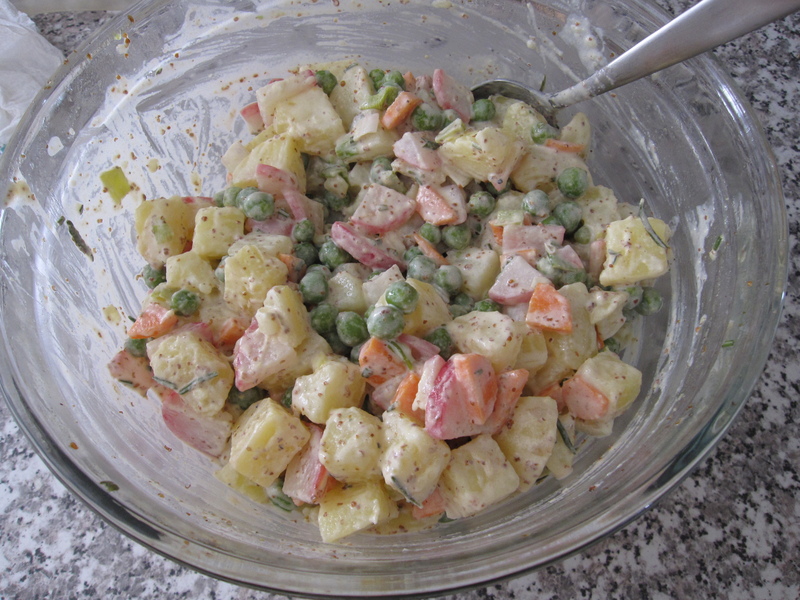 In a large glass bowl I put the peas and then strained vegetables and potatoes. While still warm I poured the dressing on top and stirred it all around. I like dressing it while still warm so that the potatoes absorb some of the dressing. To put together the sandwiches I toasted some ciabatta rolls. On the bottom I laid some baby spinach and tomato slices. I sliced up two of the steak portions and laid them on top. I covered the steak with cilantro. On the top bun I spread some mustard and mayonnaise. It was outstanding!